I’m always looking for healthy and delicious recipes. when recipes taste like this one, it is easy to live a healthy lifestyle. Its all about flavor.the other thing that’s easy to love about this recipe is how simple and quick it is to prepare. We grilled the salmon on our panini grill (its currently 20 degrees in saint louis…so we weren’t about to grill outside). Simple and quick. 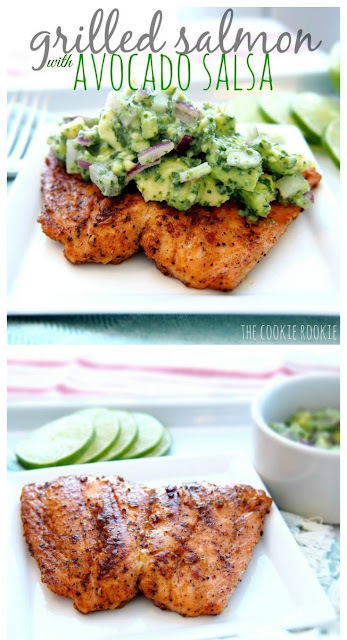 the salmon gets a rub of some delicious spices, and the avocado salsa is quick and sooo flavorful. fresh and delicious. We even grilled up a little salmon for mr. dill, you can see it in the upper corner of the picture. He was more than thrilled.